Leather trench coats have meant a lot of things to a lot of people, for years they were associated with some quite questionable secret police exploits, thankfully they broke free of that in the 1970’s and 80’s when things like Blade Runner, Neuromancer and Shadowrun came out. When those different media formats introduced the world to the concept of Cyberpunk geeks and nerds took it and ran. In gaming this peaked in the early 90’s when Syndicate came out on everything that could manage a cursor. A Cyber-noir future where corporations run the world, private security is just a fact of life, technology has become the opiate of the masses and that has led to widespread corruption. Playing Syndicate was an awakening to games that gave you the option to do things your way, even if that way was ‘guns, lots of guns’. It’s sequel a few years later, Syndicate Wars, took this concept and ran with it to produce a dark and gritty game full of corporate espionage and rain. 19 years later, here we are, looking at Satellite Reign, the ‘spiritual successor’ to Syndicate. Bullfrog, the studio behind Syndicate and Syndicate Wars, tried numerous times to get a new Syndicate. Unfortunately most people’s experience recently has only been the distinctly average FPS that tried to reboot the world. 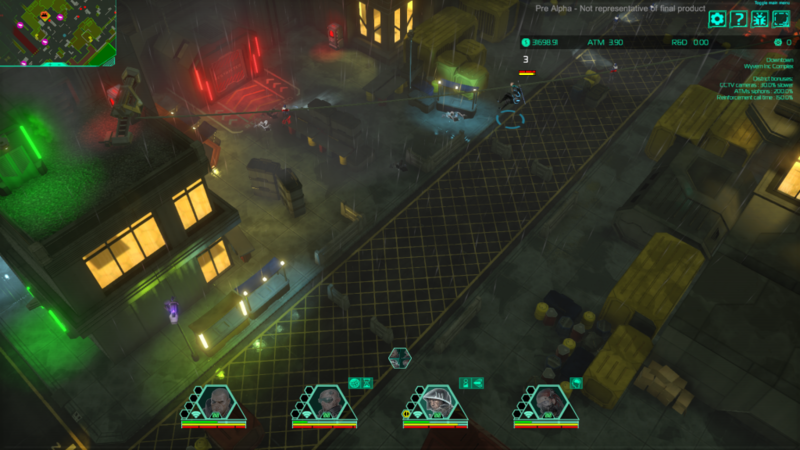 The lead designer of Syndicate Wars obviously spent the past couple of decades unable to shake that cyberpunk monkey on his back and thankfully he did, because like a nice sorbet to cleanse the pallet, 5 Lives’ have recently released Satellite Reign on Early Access via Kickstarter. 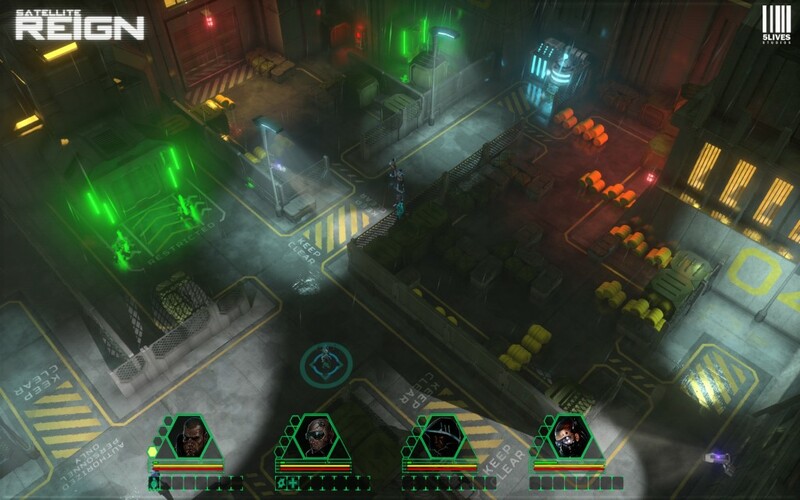 Satellite Reign follows the same basic concept of Syndicate. You are introduced to a city, perpetually trapped in the middle of a storm at night. You’re given four agents, after a little bit of rescuing, and given a choice of missions to tackle. In this current build those missions all follow a theme of ‘here’s a building, get in it’. Using your four agents in an isometric view you must navigate past security, the public and your own ineptitude to complete tasks for your employer, a corporation with enough power and money to hire four mercenaries with trench coats and guns. Often ‘spiritual successors’ are no more than copy and pastes with better graphics, this is one of many places Satellite Reign manages to break all expectations. 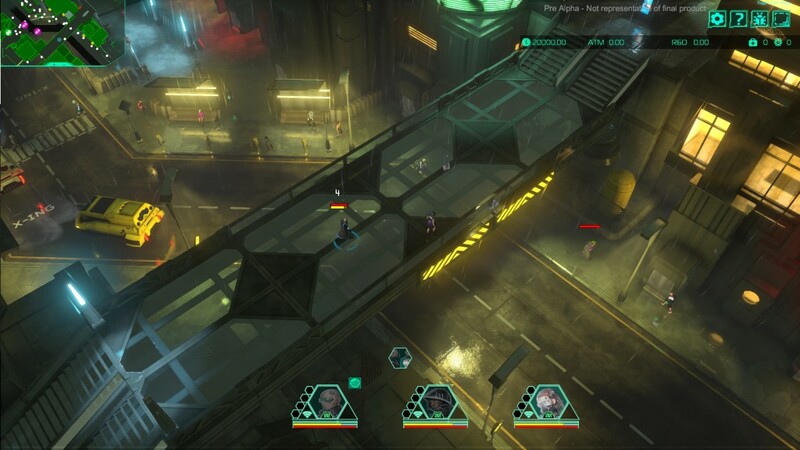 Rather than rely too heavily on the source material Satellite Reign manages to carve its own path, no more are your agents just cookie cut avatars, now they each have their own abilities and specialisms. More than that, you now have options and the potential for some true tactics to deal with scenarios. Do you knock on the front door with bullets as opposed to your hand? do you hack electronics to open a door or to shut down some pesky cameras? or do you go all mission impossible and zip line into compounds? My personal favourite is what I call the ‘Martyr Tactic’: decide which of my four agents I dislike and get them to make noise, a lot of noise, enough noise to bring anyone with a gun in the block to come looking. Meanwhile the remaining members of the squad can just stroll into where ever I require. The presentation in this game is already exquisite, the neon colours blasting out like explosions in the rain mixed with the drab decor of the city make for an emotive experience. Sirens blare, security shoot, people scream, and this is all happening before you get involved. The A.I. of the world is doing its job perfectly at this stage of development, it’s making you think it is a world. Ignoring some to be expected place-holder art, the design and audio come together to make this city fully realised. A discorded series of notes start the soundtrack but before long a pseudo techno beat is running. If someone said to you imagine a cyberpunk future, this is what comes to mind, and this is what Satellite Reign is all about, the collection of various cogs syncing to make a truly realised cyberpunk scene. Early Access games are always a hard thing to cover, I’ve got to cover the potential of a project as well as whether it is a usable product in its’ current state. There’s something to be said for the Early Access approach, I felt bad I didn’t back this on Kickstarter, and now it has made it to Steam I feel like throwing in some money now is the equivalent of backing a project on KS. In its current state the game is more of a proof of concept or demo. It’s mostly playable, there are things to do, people to kill and things to hack, but then there’s clear dead ends where there should be an item, person or objective but it hasn’t been materialised in the city yet. As a writer and reviewer the following sentiment is one I try to avoid at all costs as it is a cliché and a cheap way of ducking opinion giving, but in this situation of Early Access and nostalgia it’s true: If you’re a fan of Syndicate or cyberpunk then you should get in on this. Syndicate holds a special place in the hearts and minds of many people so to see a project like this makes a number of us geeks and nerds get wobbly knees, if that is even remotely you, then throw the team some money and actually take a fascinating trip with them seeing how the game comes along and adapts with each update. When all is said and done however go in with realistic expectations, the game isn’t finished, this is a pre-alpha build, but my god, if this is just pre-alpha then the full release is going to be something special. Next Post When Did We Stop Completing Games?